This dish brings zucchini to the forefront, and is perfect for those oversized zucchinis nestled among the leaves and blossoms in your garden. Cut zucchini in half lengthwise. Cut each length in half width-wise. Place in a large pot with about 1 inch of water. Cover and cook on medium to steam. This took my 5lb zucchini about 15 minutes. It should be tender, but not too soft. Once steamed, scoop out the innards (tip: use a melon baller), leaving about 1/2-inch border. Put the innards in a food processor and process until smooth. Transfer the innards to a bowl. Mix with the remaining ingredients, seasoning to taste. The mixture should be the consistency of drop cookie dough. If it is too wet, add a little extra flour. Preheat the oven to 350F. Place the zucchini in a glass dish, and use a paper towel to blot the insides for excess moisture. Season with salt and pepper. Scoop the almond mixture into each zucchini. 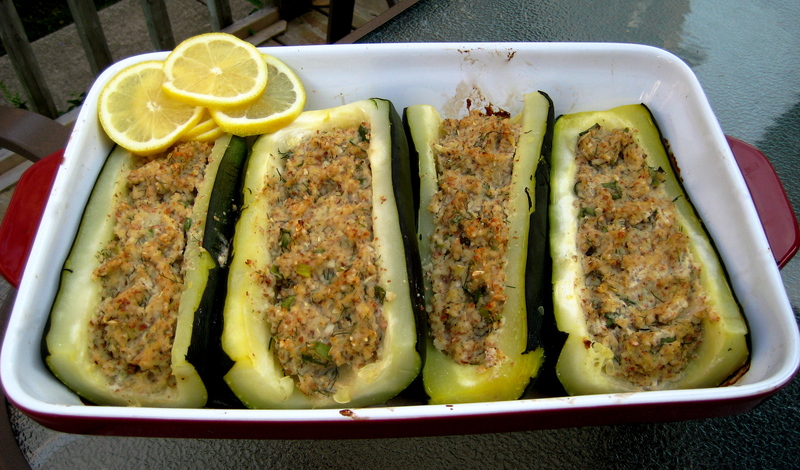 Bake for 35 to 50 minutes, until zucchini is cooked through and filling is browned. Let stand 10 minutes before serving. Serve with lemon slices. Note: if you use small zucchini, you may need to lower the baking time.